Going on a vacation to Paris but can’t figure out what to pack? 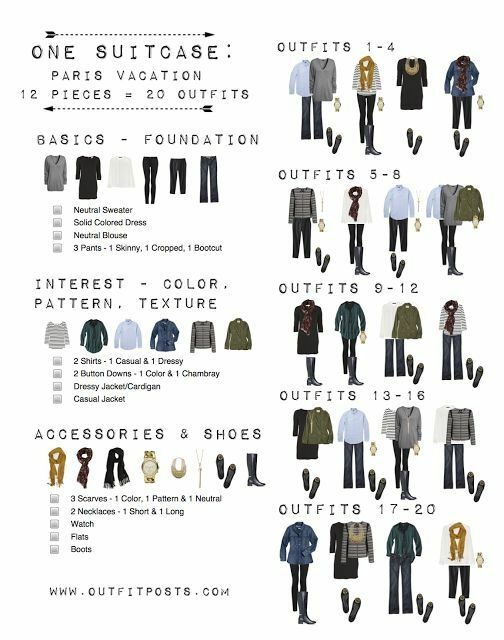 Here is an infographic of what to pack for a Paris vacation. What’s amazing is that you can pack only a few clothing items and end up with tens or hundreds of outfits because of how you can mix and match the items. In this particular infographic, there are 12 pieces of clothing items that can come out to about 20 outfits or more. The basics consist of a neutral sweater, a solid colored dress (most preferably black), a neutral blouse, and 3 pants – 1 skinny, 1 cropped, and 1 bootcut. The clothing items with a little more “flair” if you will call it are 2 shirts (1 casual and 1 dressy), 2 button downs (1 color and 1 chambray), a dressy jacket or cardigan, and a casual jacket. The accessories and shoes consist of 3 scarves (1 colored, 1 patterned, and 1 neutral), 2 necklaces (1 short and 1 long), a watch, flats, and boots. 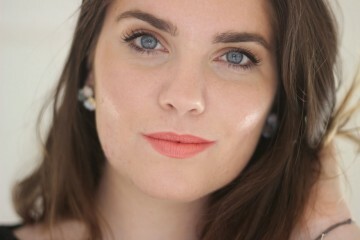 Also take a look at 10 outfit ideas to wear in Paris.